From meager beginnings in a tiny machine shop a little more than a quarter of a century ago in Camden, the plant of the Victor Talking Machine Company has expanded, until today with a capitalization of $43,070,000 it consists of 31 large modern fireproof and brick buildings with floor space of 1,534,000 square feet, where over 9,000 people are employed. Eldridge R. Johnson, the founder, was a machinist with an imagination. Therefore when a man walked into his shop to have some minor repairs made on one of the first crude talking machines, the sensitive ear of the inventor was offended by the grotesque sounds that came from the curious toy, and with the inventor's enthusiasm for perfection, he set about making a machine that would really talk, sing, and reproduce instrumental music. His first objective was to perfect recording, and when that was accomplished, to construct a spring motor that would run evenly. A total of $1,500 was all that could be spared for the first advertising effort. It was a start, however, toward one of the greatest continuous advertising campaigns, in which during the last 15 years there has been invested over $40,000,000. A good machine, a good record, an organized business, and national distribution were not the only stepping stones to Mr. Johnson's success. When he could divert his energies from perfecting the machine and launching a new company, he began the work of securing the exclusive right to record the voices and music of the world's greatest artists of concert and opera. Improvements have been made to the Vic-trola from time to time. The old horn type was replaced by the cabinet Victrola, which in turn had several changes, until recently there were introduced the Orthophonic Victrola and the Electrola. Laboratories of the Western Electric Company and the American Telephone and Telegraph Company had developed both a new method of recording and a new talking machine far exceeding in range and quality the old recording and reproducing methods, the Victor Company investigated, and the right to use the new electrical recording process and the exclusive right to manufacture and sell the new reproducing instrument, which is now known as the Orthophonic Victrola, were acquired. It is interesting that the principle of match impedance, which governs the design of the Orthophonic machine, is a mechanical application of the electrical principle which made possible long-distance telephone communication. 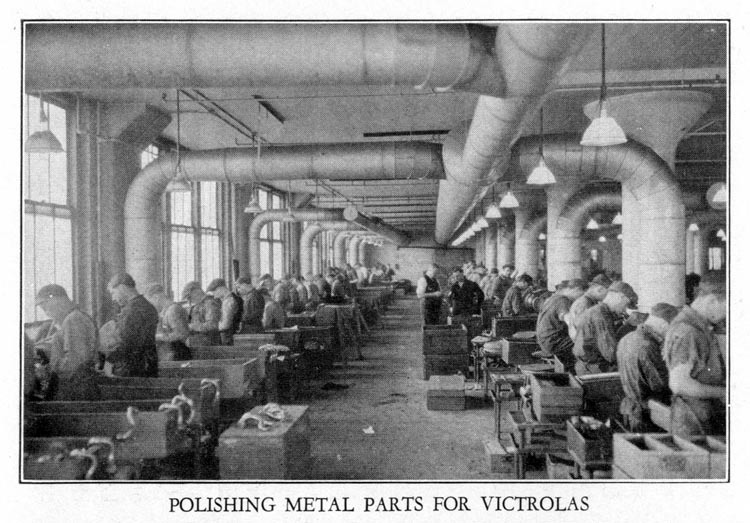 The Victor Company then placed on the market instruments containing both orthophonic reproduction from records and radio receiving sets manufactured by the Radio Corporation of America. Next came an electrical amplifying talking machine, developed by the General Electric Company, and marketed as the Electrola. In some of the larger Victor models, Radiola receiving equipment, orthophonic reproduction from records, and electrical reproduction from records are combined in a cabinet. A later development is the Automatic Victrola, which changes its own records. New Jersey: Life, Industries and Resources of a Great State, 1928, page 297.